Judy Garland and Vincente Minelli became engaged during the production of this movie. Based on stories written by Sally Benson about her childhood in early 1900s St. Louis, the movie follows a year in the life of the Smith family. Their ups and downs are shown in a series of vignettes. Esther (Garland) tries to get the attention of the new boy next door (Tom Drake). Little Tootie (Margaret O’Brien) has some scary adventures on Halloween night. Everyone is excited for the 1904 World’s Fair to open. The movie’s biggest conflict comes when father (Leon Ames) announces that he’s gotten a promotion and the family will be moving to New York. The rest of the family is unhappy about this development, but they pull together by the end in an affirmation of family unity. Although the movie has a great ensemble cast, St. Louis was a star vehicle for Judy Garland. She was 21 at the time and was reluctant to play another teenage role. Fortunately, Garland took the part, and she comes through with a fine comic performance and an expressive singing voice. The musical high points of the movie are The Trolley Song, which is infectiously upbeat, and Have Yourself a Merry Little Christmas, which was written for this movie. The other star who emerges is seven-year-old Margaret O’Brien, who was awarded a special Oscar for her role as Tootie. She is precocious as only children in movies and sitcoms seem to be, but her performance is undeniably charming. This two-disc set is loaded with extra features that will appeal to fans of the movie. On the commentary track, Garland biographer John Fricke gives extensive background into the making of the movie, the careers of the actors, and the source material. He integrates interviews with O’Brien, composer Hugh Martin and screenwriter Irving Becher. Fricke’s commentary is interesting and never rambles. Among the more interesting bits of trivia he shares are the original lyrics to Have Yourself a Merry Little Christmas, which Garland felt were too depressing. A 30-minute behind-the-scenes documentary, Meet Me in St. Louis: The Making of an American Classic fills in more details on the movie. It features interviews with some of the people on the commentary track as well as clips from an old interview with director Minelli. It includes contradictory stories about how O’Brien got herself to cry for her big snowman-smashing scene at the end. Hollywood: The Dream Factory is a 1972 documentary about the rise and fall of the Hollywood studio system, but it’s mostly an excuse to show film clips. Becoming Attractions: Judy Garland is a 45-minute Turner Classic Movies production, which traces Garland’s career through trailers for her movies. TCM host Robert Osborne adds some context, discussing how she was marketed by the studios in the various phases of her career. Among the shorter features on disc two are Bubbles, a 1930 short film with an brief appearance by seven-year-old Garland. A song recorded by Garland but not used in the movie, is played along with a photo montage of stills from the movie. This disc also has a 1966 pilot for a sitcom inspired by the movie. The DVD features a new video transfer, which brings out the Technicolor in all its vivid glory. The tone occasionally wavers, but it hardly detracts from the picture. The disc also features a remixed soundtrack in Dolby Digital 5.0, which gives the movie a rich sound. Viewers can also choose the original mono soundtrack. The disc also has a soundtrack with only music and no vocals. 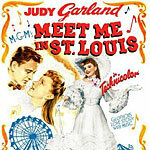 A trailer on the DVD calls Meet Me in St. Louis “Judy Garland’s Happiest MGM Musical.” It probably wasn’t exaggerating much. Audiences of 1944 would have found the movie an escape from the harsh realities of war, audiences today should be able to have the same experience.